It’s hard to believe that something as permanent-feeling as a home can be just as subject to the whims of fashion as the clothes you put on each day, but it’s true. While interior design trends might not be quite as volatile as the fashion chosen by High School’s “It” girl, there are definite fluctuations in home style and design. Even if you don’t think you’re the type to embrace a trend, it’s important for you to note what’s in and out, as it can have a big impact on your home’s value. Investing in an outdated remodel could make your home look older (and less valuable) than it actually is. 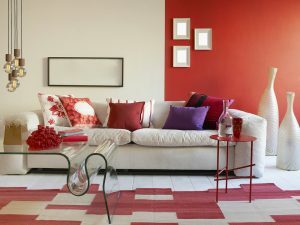 So, with that ominous word of warning, let’s get into the fun stuff: home interior design trends that we’re seeing come up in 2019! In recent years, sinks and hardware have been leaning more and more towards warm tones and antique finishes, but it’s safe to say that as we go into 2019, this trend will continue to grow. The options available for customization in sinks allow homeowners to add decorative details without getting fussy, and you’ll see more and more hammered metal details, decorative metalwork, and creative designs for basins in gold, brass, and natural stone. Speaking of natural stone, natural materials continue to be a strong trend in home interiors. If you’re remodeling a kitchen or bathroom, consider utilizing natural, eco-friendly materials wherever possible. Wood flooring, natural fibers in decorations and furniture, and warm paneling all contribute to a homey feeling that contrasts with the ultra-modern chrome finishes that kitchens featured a decade ago. This trend has been growing for a while and you can expect it to keep blooming. Plants are decor items that can’t go wrong, and their mental health benefits continue to power their addition to just about any fashionable living room. Consider creative ideas to incorporate houseplants, instead of just setting a large pot in a corner. You might create special ceiling panels from which leaves dangle down, alcoves in a sunny kitchen, or opportunities for hanging pots in a corner. To complement the strong greenery, bold colors and graphic, tribal prints are making a comeback after a few years of favoring soft, neutral colors. These strong colors can be found in statement ceilings or walls, in addition to furniture and decorative elements.